Burned equipments inside the Bicol International Airport. Photo by Daraga Municipal Police Station. Legazpi City, [09.29.17] – At least eleven heavy equipment went up in smoke inside the construction site of Bicol International Airport on Thursday evening after a group of suspected rebels torched anew the construction equipment inside the Bicol International Airport construction site in a latest NPA offensive in Barangay Alobo, Daraga. Albay, police report said. According to Police Chief Inspector Arthur Ramirez Gomez, the Public Information Officer of the Albay Police Provincial Office, the incident transpired between 7:30 and 8:00 o’ clock in the evening , while the construction equipments were parked inside the said constraction site. Initial investigation conducted by joint team from Albay Police Provincial Office, Daraga Municipal Police Station, PNP Crime Laboratory and Arson Investigators of Daraga Fire Station revealed that heavily armed men came from the west portion of Barangay Burgos entered the the construction site and torched the eleven  construction vehicles and left the scene towards the same direction. The management of EM Cuerpo Builders Incorporated is yet to submit the cost of damages incurred to burned 5 heavy dump trucks, 1 mini dump truck, 1 unit double cub, 1 unit grader,1 unit mixer, 1 crane and 1 owner jeep type. The arson incident came almost simultaneously to the harassment 2nd Manuever Platoon of Albay Provincial Public Safety Company based at Barangay Bascaran, Daraga, Albay who was fired upon by the armed rebels, while the Philippine Army patrol base located at Barangay Alobo,Daraga, Albay has engaged in a firefight lasted for almost 25-30 minutes, the report said. No casualty reported on the government side. 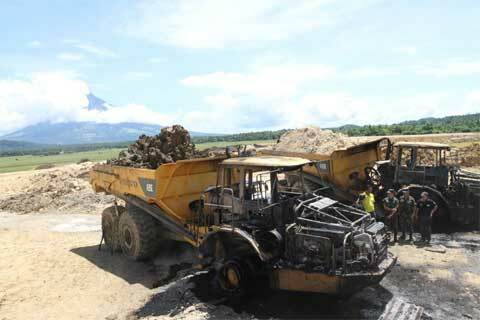 Burned heavy equipment inside the Bicol International Airport in My 2012. Photo by Albay Provincial Government. In May 2012, some 20 armed rebels attacked the army detachment based in Barangay Alobo which led to the wounding of army soldiers of the 901st Infantry Brigade identified as Army Private First Class Ard Ryan Gayapao and Jomar Cornal. 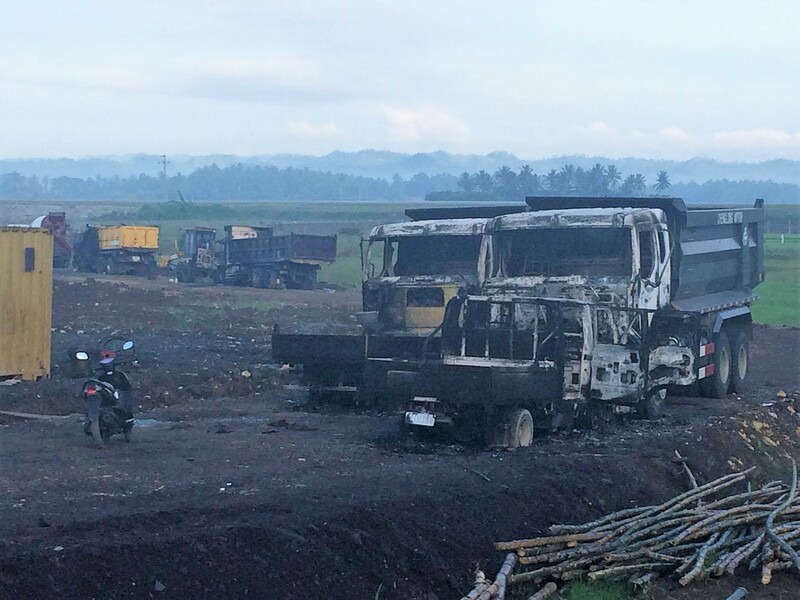 The suspected rebels burned 12 heavy equipment worth P75-million. An arson and frustrated cases was filed before the Albay Prosecutor’s Office against the suspects who were identified by the witness as the following; Rolando Alcera, a resident of Barangay Talisay, Oas, Albay, Dante Orcio of Barangay Comon, Camalig, Albay, Eduardo Sevilla of Barangay Buga, Libon Albay, Rolito Calayas alias Ka Igme of Pioduran, Albay and Jose Bernardino alias Rico, also of Pioduran, Albay. Leaving Alobo. 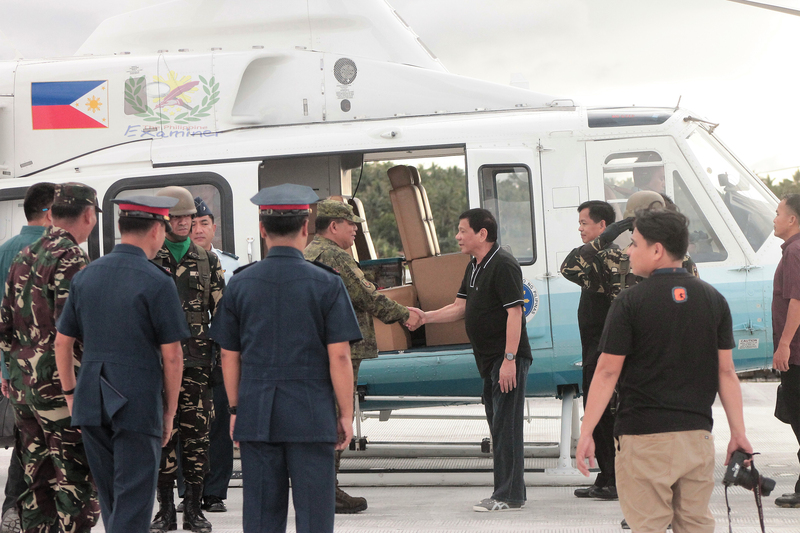 President Rodrigo R. Duterte shakes hands with Brigadier General Manolito P. Orense, the Division Commander of the 9th [Spear] Division, Philippine Army as he departs the Bicol International Airport after the ground breaking ceremony last December 2016. Photo by The Philippine Examiner. Last December 2016 the ground breaking ceremony of Package 2A: Construction of Landslide Facilities or the Site Development of Bicol International Airport Thursday was attended by President Rodrigo R. Duterte. The landslide facilities will house the administration,terminal,air traffic control,crash fire rescue,powerhouse. air traffic control,maintenance,material recovery facilities, pump room and water reservoir,chlorination House 1 and 2, guard houses and the Civil Aviation Authority of the Philippines quarters. The project is expected to be finished in 2019.